DC Design leads a workshop in Austin, bringing together architects and clinicians to redesign emergency departments at hospitals. Surprisingly, these two parties have never come together before. While major shifts in how we think about healthcare and align medical incentives are needed to address many of the root causes, there remains an immediate need to make the emergency department work better as a place for providing quality patient care. At the Reimagining the Emergency Department (ED) workshop in Austin this October, we applied the design-thinking philosophy to challenges in the medical system. In collaboration with the Facility Guidelines Institute (FGI) and the American College of Emergency Physicians, DC Design hosted a one-day event, which included more than 100 doctors, nurses, architects, and medical students. To answer these questions, we worked with this group to apply the design thinking process, and its 5 stages: Empathy, Define, Ideate, Prototype and Test. Together we identified and targeting specific challenges plaguing our healthcare system. To learn about the philosophy and approach we use in greater detail, see our piece here. Empathy is to understand the user’s world and the problems he or she faces. Healthcare architects interviewed clinicians from across the US about the challenges they face in delivering care. For the architects, this was a rare opportunity to get explicit and specific feedback on what is working well and what is not working in the emergency department. They learned about some of the positive aspects of EDs that should be maintained as well as how problematic working in some of the standard Emergency Departments can be due to the design and layout of the space. Upon defining these and other challenges, clinicians and architects brainstormed solutions. Create a flexible patient space separate from higher complexity patients. Use more tech to facilitate the capture and transmission of information, reducing staff loading. Create a new position called the patient navigator to specifically make sure these patients are treated in a timely manner. After teams ideated, we pushed them to make their ideas tangible, creating prototypes that could be used to get feedback on whether their ideas would work or not. Here the goal was to prototype their solutions and test them early, allowing for crucial feedback well before millions of dollars are spent. 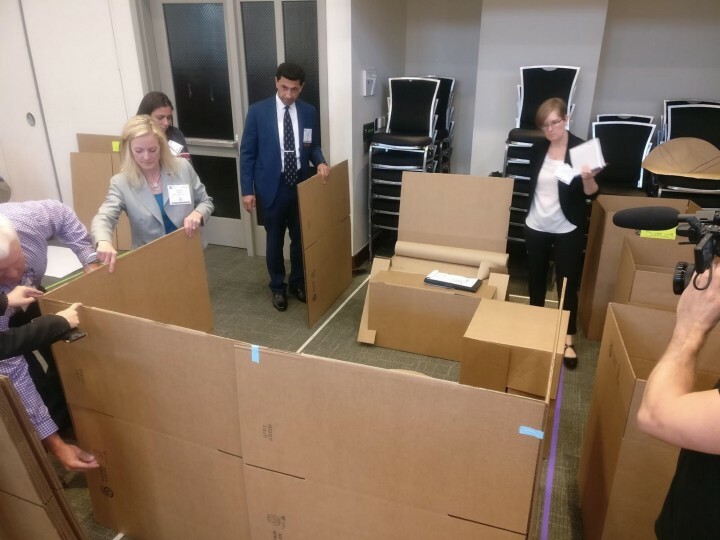 To facilitate this process, we had a variety of tools available including taped out full-scale mockups of emergency department spaces, cardboard stretchers, chairs and other equipment, as well as the materials needed to create tabletop models to analyze flows through designed spaces. After building their prototypes, teams tested them with doctors and nurses from other teams to get feedback on the efficacy of their ideas. The doctors and nurses offering feedback were from clinics all across the country, allowing for feedback to be gathered from a variety of perspectives. Here are some of the prototypes they came up with. A team creates a modular treatment pod in 4 bed configuration, enhanced with interactive patient screens to provide faster consultation and treatment for medium to low complexity patients — invokes the proven model of European Fast-Track designs to treat patients faster. 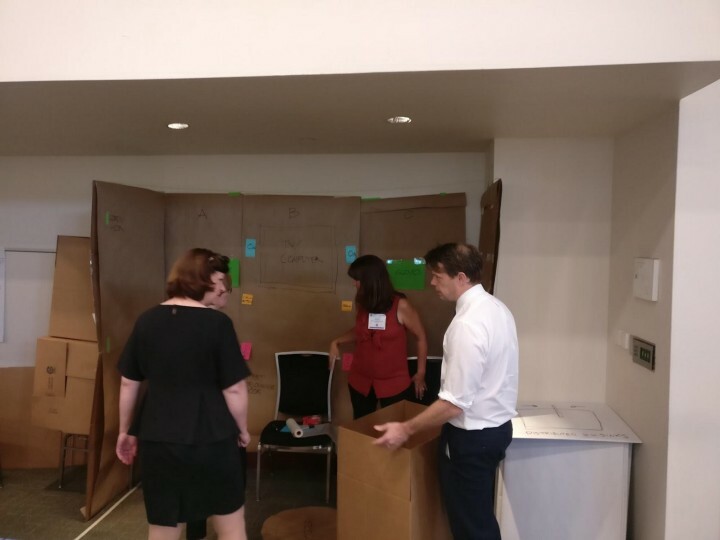 A team prototypes a pop-up hallway space that can serves as an as-needed treatment space for medium and low complexity patients while helping to address waiting room overcrowding. Self check-in kiosk that records or receives a patient’s reason for their visit and records body temperature, pulse rate, respiration rate, blood pressure, oximetry, weight, and height. Based on these factors, it directs patient to the appropriate room for best treatment. Participants rethink Emergency Department flow around a centralized doctor and nursing station reducing clinician walking distances. The Facility Guidelines Institute (FGI) creates facility guidelines for hospitals and clinics around the country. While cross evaluating the designs the teams created with research based evidence and patient insights is a necessary future step, ultimately these interdisciplinary designs will serve as a starting point of consideration as FGI reevaluates the Emergency Department guidelines going forward. There is a real sense that bringing together these different stakeholders has the potential to really make a difference in how we deliver healthcare in this country. Dr. Ben Bassin from Ann Arbor, Michigan, agrees.